This colorful large, shallow bowl is perfect for serving a full batch of this pasta recipe. Click below for matching individual pasta bowls. This is the only small appliance that I leave out on my counter, because I use it daily for food prep. In this recipe, I used it to mince the garlic in a few pulses. I love this knife. Its non-stick resin coating resists corrosion, makes cleaning simple, and helps the 8" blade glide through tomatoes and bread with ease. And, you can't beat the value pricing. These are handy for mixing the pasta, cheese and sauce, yet elegant enough for serving. This is my go-to knife for chopping virtually anything. It is weighted perfectly and holds a sharp edge. 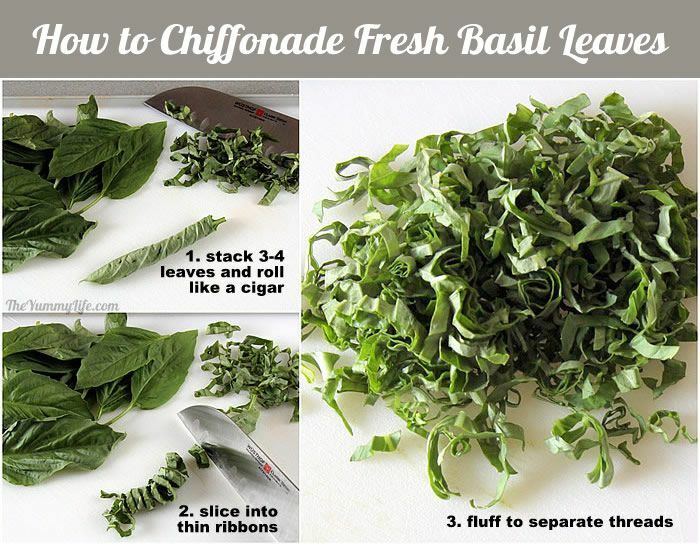 In this recipe, I used it for quickly cutting the chiffonade basil shreds. Combine simple ingredients for a healthy sauce with big flavor. Combine simple ingredients for a fresh, healthy sauce with big flavor. Serve warm, cold, or at room temperature. Can be made ahead. BOIL THE PASTA according to package directions, being careful not to overcook it; drain well. Add cooked pasta to a large, shallow serving bowl. Pour tomato sauce mixture over pasta, top with Parmesan cheese, and use tongs to gently mix. Top with additional fresh basil chiffonades. Serve with additional Parmesan cheese to sprinkle on top of individual servings. Nutritional Information for one 2-cup serving: 334 calories, 15g fat, 403mg sodium, 41.2g carbs, 2.1g fiber, 12g sugars, 11.8g protein; Weight Watchers PointsPlus: 9. High in vitamins A & C, iron, and calcium. High in carbs due to the pasta. Inspired by Ina Garten's Summer Garden Pasta recipe. There are so many things to love about this sauce recipe. It's easy. Cut the tomatoes, stir them together in a bowl with a few ingredients, let the bowl sit for a few hours, and an amazingly flavorful pasta sauce is born. No cooking. 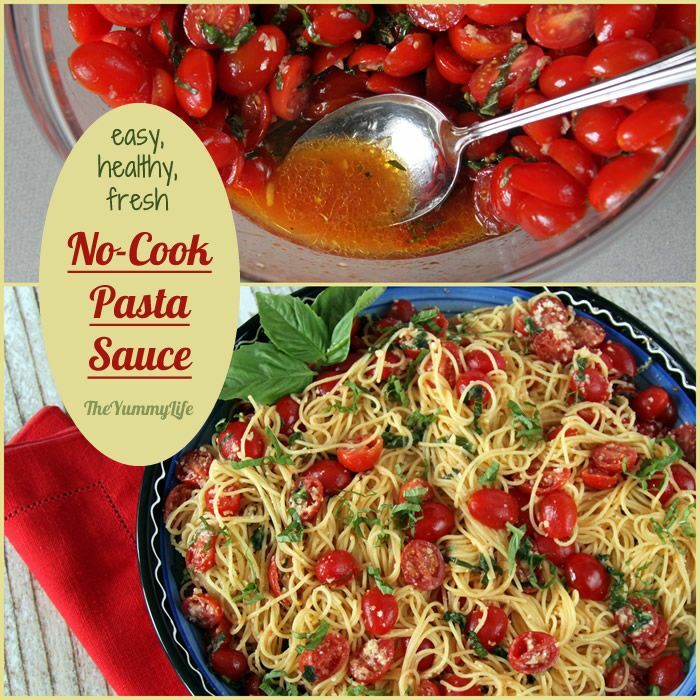 Although I love a slow cooked marinara sauce, this fresh pasta sauce is my go-to favorite. As they sit, the tomatoes macerate (release their juices) to magically create a sauce without any cooking at all. A fresh sauce that can be made year round--even in winter. Although most tomatoes are only good when they're in season in the summer, cherry and grape tomatoes are flavorful and available throughout the year. In the dead of winter I can make this sauce to satisfy my craving for fresh-tasting food. Tossed with pasta, it's a versatile main course or a side dish. It can be served warm, cold, or at room temperature. It can be made ahead for the ultimate convenience. It's always popular with company and at pot lucks. It keeps well and makes great leftovers. It's made with simple, whole, nutritious ingredients. Make ahead and take along. Because this pasta can be served at room temperature, that makes it a great choice to take to potlucks, picnics, and parties. I recently made an Italian lunch for my sons' company, Less Annoying CRM, pictured below. This pasta along with my Antipasto Platters were a great combo for a make-ahead meal...and a big hit with this group of hungry workers. She's one of my favorite celebrity chefs. Her recipes are simple, delicious, thoroughly tested, and use real, whole food and accessible ingredients. I own most of Ina's cookbooks. This fresh pasta sauce is inspired by Ina's Summer Garden Pasta from her cookbook, Barefoot Contessa at Home. I've also seen her demonstrate this on television. So, thanks Ina. This one's a real winner! Step 2. 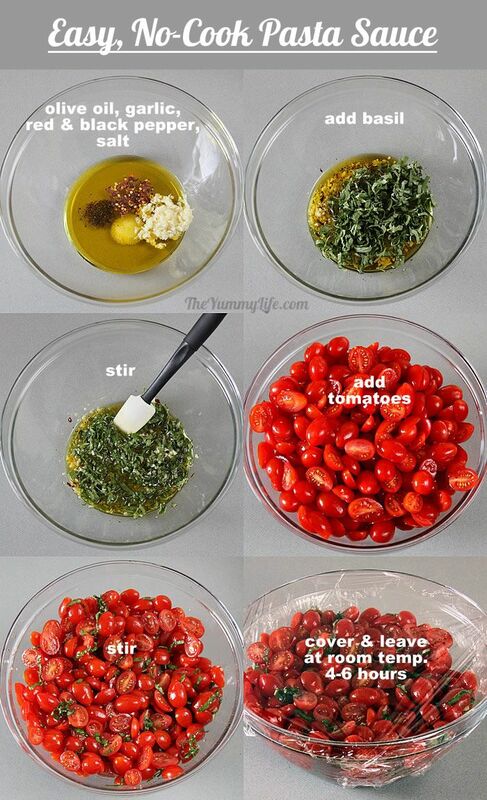 Slice each tomato in half. The fastest and easiest way to cut a bunch of them at once is to sandwich them between two rimmed, flat plastic lids as pictured below. You can cut a pint of cherry tomatoes in under a minute. 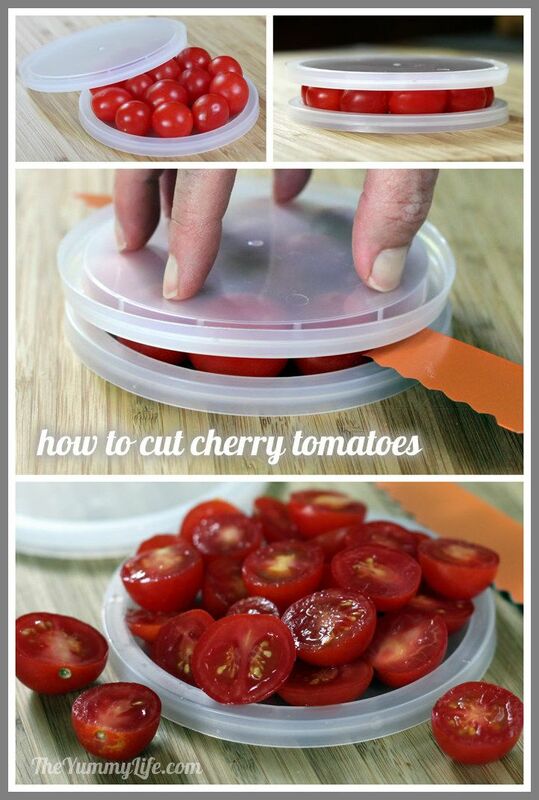 Read more details about this timesaving technique in my post: Easy Way To Cut Cherry Tomatoes. You can use all red cherry/grape tomatoes, or any combination of red, yellow, orange, purple....whatever is available and to your liking. I like to include some Sungolds when they are in season. Step 3. Mince the garlic. Use a knife, garlic press, Microplane, or a mini food processor. I keep this chopper handy on my counter, because I use it so often. If I need to mince several garlic cloves, I let this little machine do the work in just a few pulses. Step 4. Chiffonade the basil. This is a specific way of cutting basil (and other large leafy herbs like mint) resulting in thin shreds. Make sure you use a sharp knife. Stack 3 or 4 basil leaves and roll them up like a cigar. Cut in thin slices, separate and fluff the cut rounds. TIP: Don't cut the basil in advance--cut it right before you use it. That's because once the cut edges are exposed to air, the basil will begin to darken. Step 5. 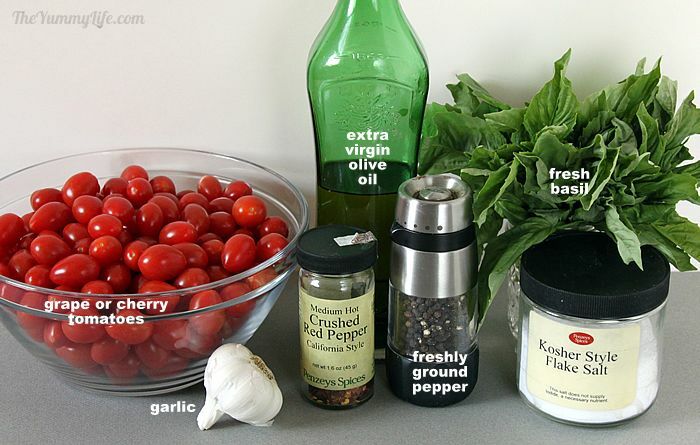 In a large bowl, combine the sauce ingredients: olive oil, peppers, garlic, salt, and basil. Then stir in the cut tomatoes. Cover and leave out at room temperature for 4 to 6 hours. The sauce mixture macerates as it rests. 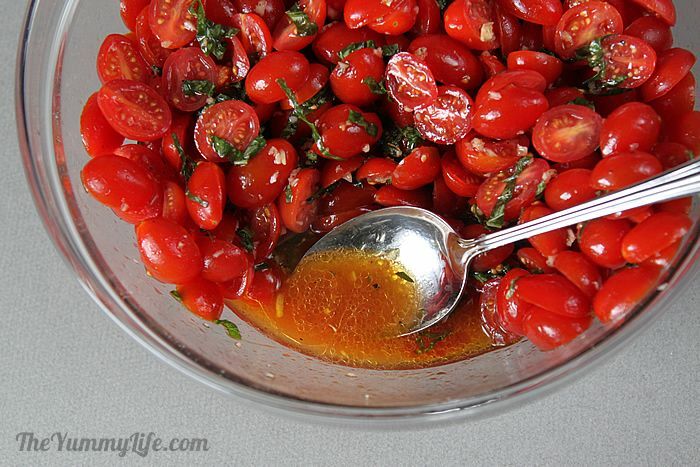 That means the salt and olive oil draw the juices out of the tomatoes. I'm always surprised how much liquid is in the bottom of the bowl after the mixture has rested for a few hours; that's how the sauce is magically created. Also, the flavors develop and improve and the garlic mellows as it sits. It tastes amazing with no cooking at all. MAKE-AHEAD TIP. The sauce can be made the day before, macerated at room temperature, and refrigerated overnight. Unlike full-sized tomatoes, the texture of cherry tomatoes isn't compromised in the refrigerator. 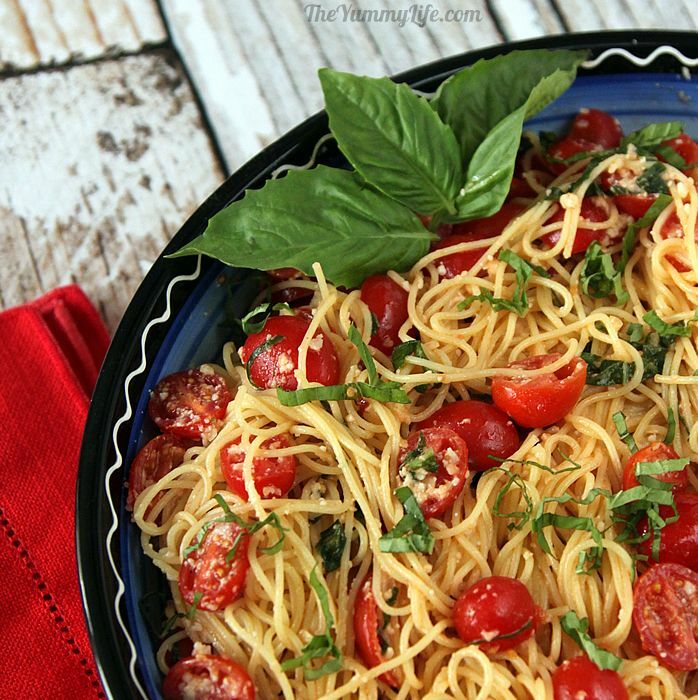 That makes this fresh tomato recipe particularly flexible and forgiving. Use it the same day it's made or on the following day--it tastes great either way. Step 6. Shortly before it's time to eat, boil & drain the pasta according to the package directions. I prefer angel hair pasta with this sauce, because it is thin and delicate and easily absorbs the sauce flavor. And, it cooks in just 4 minutes, adding to the ease and quickness of making this dish. But, feel free to use whatever pasta you prefer or have on hand. Step 7. 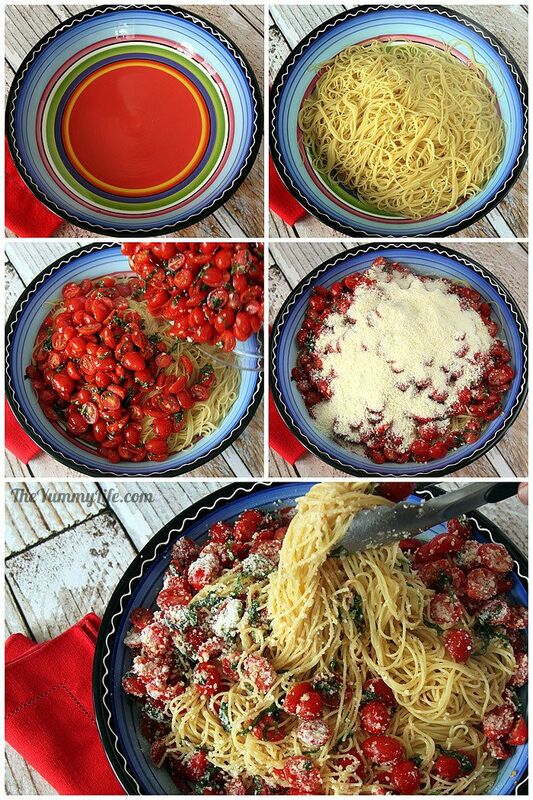 In a large, shallow serving bowl, add the cooked pasta, then the tomato sauce mixture, then the Parmesan cheese. Use tongs to gently toss it until it's combined. 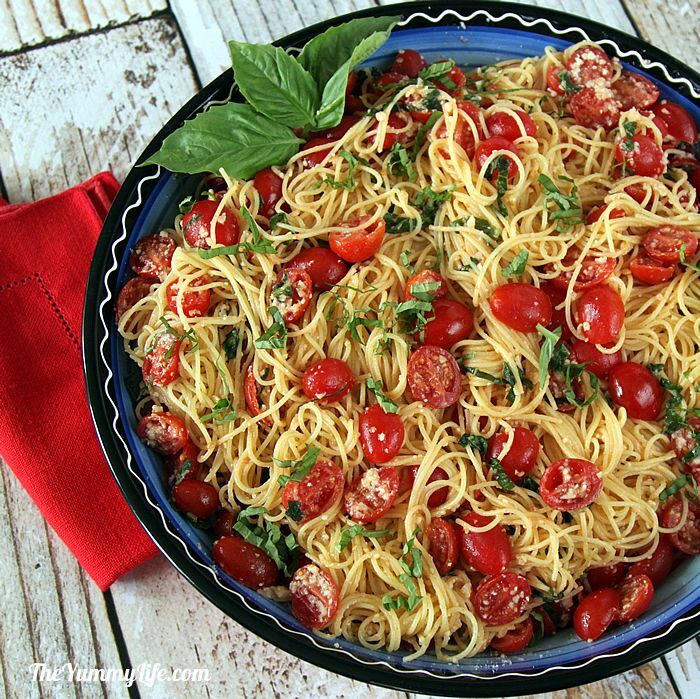 The tomatoes have a tendency to settle in the bottom, so you may need to scoop some of them from underneath and distribute them on top of the pasta. view on Amazon: my large pasta serving bowl -- it's big enough to hold the full batch with ample room for tossing and mixing the pasta, cheese, and sauce. Matching individual pasta bowls--these also make great salad bowls. Step 8. Chiffonade 3-4 additional basil leaves and scatter them on top of the pasta. Garnish the bowl with additional basil leaves, if you like. Dinner is served! Have extra grated Parmesan available for sprinkling more on top of individual servings. view on Amazon: pasta and salad tongs -- these are handy for mixing the pasta, cheese and sauce, yet elegant enough for serving. Any temp will do. This can be a main or side dish and served warm, cold, or at room temperature. I normally serve mine at room temperature; that way I don't have to stress about keeping it warm, and it tastes fabulous! Great to take along. Since this can be served at room temperature, it's a perfect dish to take along to share at potlucks, picnics or parties. This plastic bowl comes with a cover (it's actually a pie carrier), and is the perfect size to hold a full batch of this pasta recipe. 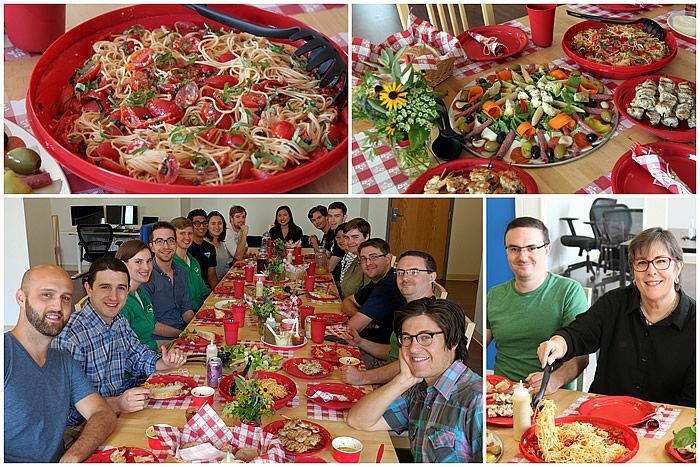 I used it for toting and serving this pasta at the Less Annoying CRM luncheon pictured at the beginning of this post. Part of an awesome menu. I most often serve this along with grilled shrimp, fish, or chicken. Add some garlic toast and a salad or antipasto, and you've got a crowd pleasin' meal! Add-ins. Although I prefer the simplicity of the ingredients in this recipe, you can customize it with optional additions like toasted pine nuts, olives, or whatever suits your fancy. This pasta dish tastes just as good, if not better, the next day. The recipe makes a generous amount, so we always look forward to leftovers. 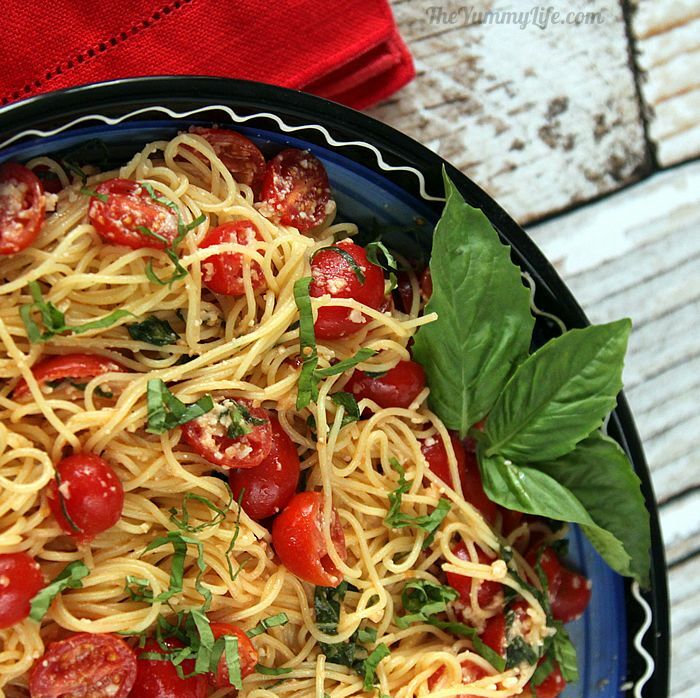 Easy, Fresh, Cherry Tomato No-Cook Pasta Sauce. Combine simple ingredients for a fresh, healthy sauce with big flavor. Service it warm, cold, or at room temperature. Can be made ahead and is great to serve company or take to pot lucks. From The Yummy Life.